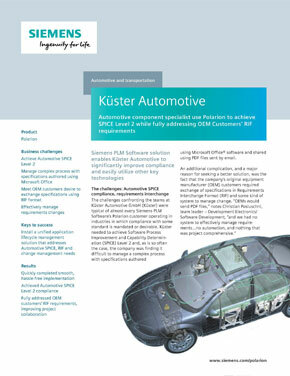 Küster Automotive GmbH produces components for the automotive industry. The challenges confronting the teams at Küster were typical of almost every customer operating in industries in which compliance with some standard is mandated and/or desirable. Küster needed to achieve SPICE Level 2 and the company’s OEM customers required exchange of requirements in RIF (Requirements Interchange Format). Küster found Polarion’s application lifecycle solutions ideally suited to their needs. The all-inclusive solution, and the web-based architecture would save on both adoption and maintenance costs.